I have wanted to visit Bhutan ever since I first saw a picture of the famous Tiger's Nest in a magazine years before I started Dragon Travel. It has been my dream to see this place and the rest of Bhutan, of course. As this is the year of Tiger I thought it would be right to see the Tiger's Nest (actually it is a monastery) and fulful my dream to see it this year. Bhutan is not a country that anybody can just turn up on its doorstep and enter. It is almost as if you have to be invited and approved by the country itself. To make these arrangements falls to our duty as the UK end of the link, Dragon Travel, and our local office in Bhutan in cooperation for our visit, and for all our future clients who wish to visit Bhutan. 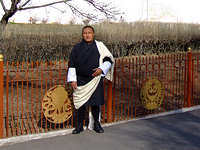 Bhutan is not open to independent internet booking. To get to Bhutan is also not particularly direct from the Western world. It requires 2 separate airlines and 2 separate flights to get there. We left the UK on Friday evening and arrived in Bangkok on Saturday afternoon, staying overnight at the lovely 5* Novotel Bangkok Airport hotel for one night. This was necessary as we had to get up about 4:30 next morning to get to the airport terminal for our 'Druk Air' (Bhutan Airlines) flight into Bhutan at 07:00. The flight takes about 3 hours to Paro because of a touch-down in Badogra, Northern India, en-route. The flight is very pleasant with the most spectacular final part, startings about twenty minutes before landing. The pilot announced that people sitting on the left hand side of the aircraft should look out of their window. I turned and looked and the view outside was magical. The top of Himalayas mountain range was almost at my eye level across the tops of the clouds resting below us. The white tops of the mountains were covered with ice with cloud circling just below the pointed tip. I felt like I was on top of the mountain. This view disappeared in a few more minutes as the plane turns left and headed down for landing, another extraordinary scene as the plane slipped down between the mountains on both sides into the green valley below. As the plane dipped down toward the valley the view of the rustic green hills and rocks flew by closely with just a scatter of white cloud floating across our flight path outside the window. In my young days I read Chinese stories about Gods descending from heaven and this is what I felt. As the plane closed to the runway I could see the traditional architecture of Bhutanese white houses with the pagoda style rooftops resting all among the hills forming a beautiful and unspoilt landscape. The airport terminal is also built in a traditional style of architecture. The first lovely sight you will see arriving at Bhutan is that nearly everybody wears traditional dress: the men wearing a 'Gho', a long robe hoisted at the waist and held in place by a belt. 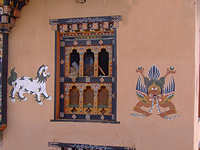 The second sight you will notice coming to any village or town are the symbolic paintings on the walls of peoples houses for good luck and protection against bad spirits. The most popular are the four animals: dragon, gryphon, white lion and tiger. Our guide was waiting for us at the airport wearing his 'Gho', as was our driver. The air was cold but it was a sunny wintry day as we drove from Paro airport to the capital city, Thimpu. It is about 2 hours journey following the valleys along the rivers through the beautiful countryside. We stop en-route for view of an old monastery and the 3 famous Stupas in Nepalese, Tibeten and Bhutanese styles. We arrived at Thimpu and checked-in at the Phuntsho Pelri hotel. This is a standard-class hotel in local Bhutanese style. In Bhutan, there is no hotel star rating system. It is either the local Bhutanese style of hotel or one of the newer deluxe hotels built in combination of local and modern architectural styles. 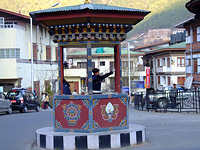 This hotel is situated right in the centre of the town behind the main street of shops and local bars and restaurants, and quite near the site of Bhutan's one and only traffic-light - now replaced by a more effective traffic cop. The room was clean and comfortable with en-suite bathroom. There are two or three lovely boutique shops in the hotel lobby displaying local arts and crafts. We had a nice lunch of local red rice, fried noodles, fish and vegetables all washed down with the local favourite, Druk beer. 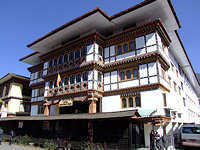 This will be the standard-category hotel we will be using for all our guests in Thimpu.